This isn’t meant to be a list of classic films. In fact, many classics would find it difficult to creep on to this list. These films don’t have to have bemusing screenplays, flawless acting, blood-pumping soundtracks, or brilliant cinematography. But they are all linked by that special je ne sais quoi which makes me able to watch them time and time again. That isn’t to say there aren’t plenty of great movies that share this rather dubious accolade. I could and would watch many of them again, but the experience is always be somewhat diminished from that initial viewing. The films on this list, however, have something special that gives them enduring longevity. It’s not the film itself but the film experience that counts. With the intricacies of the plot laid bare, the twists, turns, shocks and surprises all blunted by experience, what’s left is whatever ethos the film can conjure up. Which is precisely what some cult classics manage so successfully. Umberto Eco once wrote that “Casablanca became a cult movie because it is not one movie. It is “movies”.” 1Umberto Eco, Travels in Hyperreality, (London, 1986), p. 208. His point was that the film itself wasn’t any particular gem, but it encapsulated what movie-goers expected to see. The lines were famous before they were spoken, perhaps the most famous line of all being the one that wasn’t even in it (“Play it again, Sam”). But films that are able to do that go on to be remembered long after they’re made, irrespective of their individual merits and the quality of their cinematography, acting or screenplay. This is simply a list of films that qualify merely on account of springing to mind first when considering what makes a film rewatchable. They’re mostly quite mainstream, with a heavy slant on the action side, no doubt in part because drama is a singularly poor trait for repeat value. But they are foremost a very personal example, and I doubt whether others will share even a portion of their number. This is of course a complete cheat entry, as there are more films here than in the rest of the list put together. Nevertheless, the series is a perfect representation of what I mean by a film ethos somehow entirely separate from its content. In fact, the film ethos is so far separated from the material, that there is no real storyline threading the films together—one could go as far as to say the films do better being stood in isolation than seen as part of a series. The contradictions are numerous, the plots often bear scant relation to one another, with hardly ever a reference to what went before or what will come after. How else could so many actors have played multiple roles in the series? The Bond films are an encapsulation of fantasy and escapism, the same as their belletrist predecessors. The third Fleming novel, Moonraker, was less well received in comparison to the other Bond outings, primarily because it is set entirely in England, and without the exotic locations that characterise so many of Bond’s adventures, the book lost some of its charm. The films endear to precisely those same principles, and would in a sense be incomplete without the clever gadgets, fast cars, racy women, wicked villains and so on. That’s not to say that each film is a carbon copy of the others, merely that watching a Bond film is entirely akin to unwrapping a chocolate bar: the experience will be entirely what you expect. Although the films are not in themselves particularly bad, there is nevertheless plenty to criticise. The plotlines are often genuinely ludicrous, the villains are cardboard cutouts, and Bond himself, despite the change of actors and the seemingly unaged complexion after nearly 60 years of service, is a great ball of clichés. Which is curiously entirely to the series’ credit. 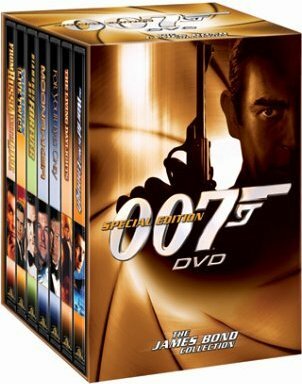 Bond can find himself challenged by a chess Grand Master, a karate world champion, or a marathon race through the desert against a camel, and he will come through looking as though he were about to attend the embassy ball. As Raymond Chandler put it, “Bond is what every man would like to be and what every woman would like to have between her sheets.” That just about sums up one of the greatest figures in cinema’s history. 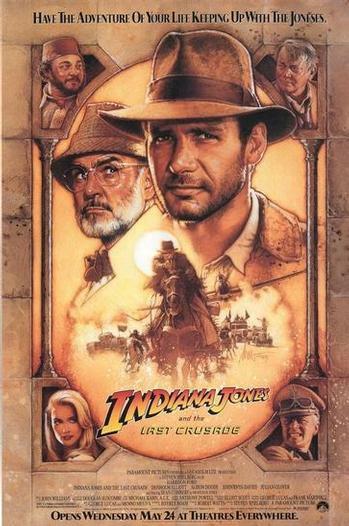 Indiana Jones & The Last Crusade was the film which started this list. One idle Sunday afternoon when I should probably have been mowing grass, revising for exams, or generally doing something vaguely productive, I had a flick through the TV guide and noticed this film was on. Before another thought popped into my head, the TV was on, my feet were up, and a mug of hot tea had magically appeared on the table beside me. This film certainly bears plenty of relation to the previous entry. The most obvious link is that the character of Indiana Jones was modeled to a large extent on that of James Bond. Adequate reason to have ‘the father of Bond’, Sean Connery, play Indiana Jones’ father in this outing. This extra dollop of charisma on top of Harrison Ford’s already powerful on-screen presence was probably what made this film the best in the series in my opinion. But the film series in general also shared much in common with its Bond inspiration, including the characteristics of its tough and endearing hero, the exotic locations, evil villains (plundering the Nazi legend for all its worth), and plenty of stunning action sequences, lightly peppered with short comedy elements. Even the formula James Bond intro sequence, that had little if anything to do with the main plot, was incorporated into the series. Whilst the film offers nothing truly spectacular in comparison to many other films of the action/adventure category, nevertheless it built upon a successful heritage and represents one of the best in the genre. The story is solid enough that the film doesn’t simply feel like a collection of action sequences flimsily strung together, although if we’re honest, the film might just as well be described as a visual rollercoaster. John Williams’ accompanying music provides one of the most recognisable signature tunes, and as I’ve mentioned elsewhere on this blog, the ending provides one of the most satisfyingly cheesy farewells in cinematic history. Should you already have pictured what the rest of this list would look like, Duel probably wouldn’t have figured among many people’s guesses. This low budget and innocuous little film has earned the acclaim of having established Steven Spielberg’s career, as the first of three TV movies he produced for Universal Studios. Quite how I’ve managed to watch this film more than once is rather a surprise to me, given that I think every time I’ve noticed the film broadcast it has started at some unreasonably small hour in the morning. Nevertheless, the film has a certain charm about it that makes it so readily watchable. The simplicity of the story—a commuter on a lonely road finds himself harassed to the point of attempted murder by the unknown driver of an articulated truck—nevertheless fills the film’s 90 minute runtime nicely. With only one real character, and the open road for most of the filming, watching it is something akin to experiencing the thoughts of a man having a nightmare. The viewer literally is David Mann, murderously pursued by a great hulking truck for no apparent reason, attempting to find some kind of compromise, solution or escape. 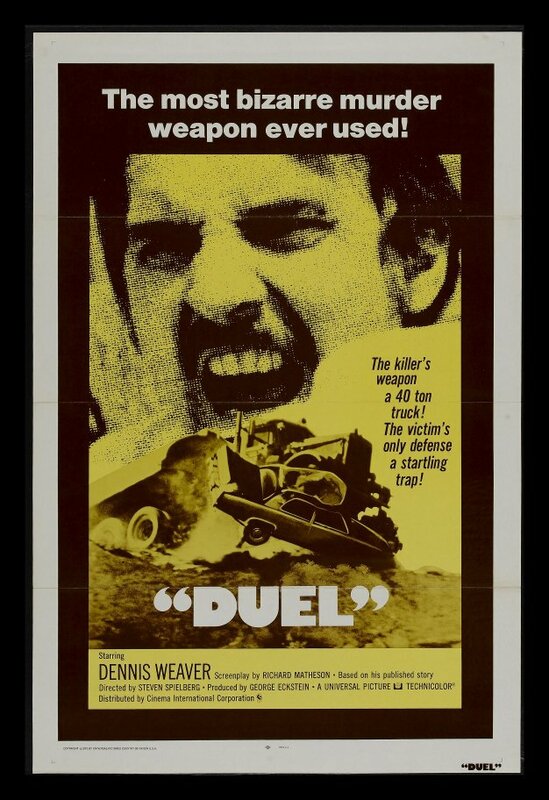 Whilst elsewhere described rather nicely as a cross between a road movie and a monster film, Duel somehow has a satisfying, almost calming effect watching it. Perhaps it’s the TV equivalent of staring into a burning fire. Or perhaps it’s just a damn good film. 1. ↑ Umberto Eco, Travels in Hyperreality, (London, 1986), p. 208.